Fig. 21. A tuned-base oscillator with feedback from the collector winding. 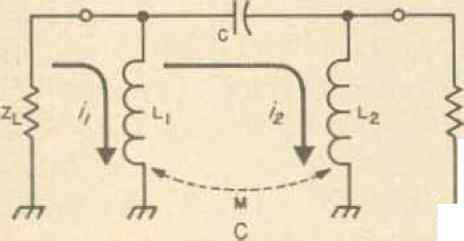 A better impedance match to the base of the transistor may be obtained by using the tapped inductor as shown in B.
for example, a series LC combination is inserted in both the base and collector leads, which together form the necessary resonant circuit. 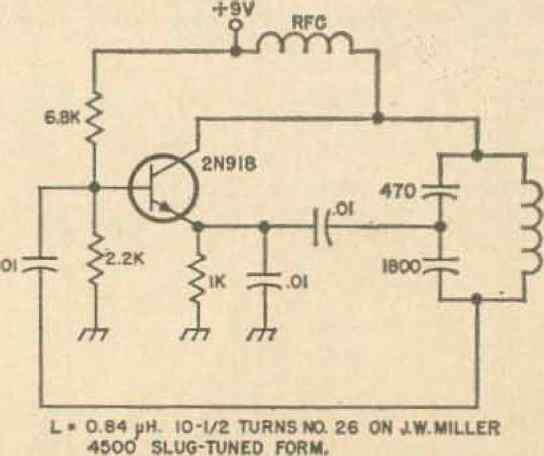 Fig, 20 shows an oscillator with the tank circuit connected between the collector and base with feedback taken oil the tank circuit by the in-phase feedback winding and applied to the emitter. 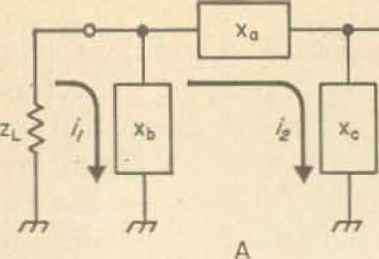 Most of these simple circuits have one very serious disadvantage—the frequency of oscillation is very dependent upon the collector resistance of the transistor. There is some dependence on the transistor characteristics in all oscillator circuits, but in the circuits of Fig. 20 and 21? the influence of the transistor predominates. One of the big questions that invariably arises is what circuit to use in a specific application. In many cases the Clapp oscillator is chosen, particularly for VFO's, because in practice stability is somewhat easier to obtain. For other applications though, both the Hartley and Colpitts find favor. Between these two the choice is more difficult, However, as a rule of thumb, the Hartley is more satisfactory at the lower frequencies, while the Colpitts works best in the high-frequency and VHF range. The reasons for this are quite complex, but they can be explained fairly simply with a couple of block diagrams. Fig + 22. The current flow in the feedback paths of the Colpltts and Hartley oscillators is shown in B and C. The genera) case fs illustrated in A. However, in a practical circuit there is base loading, series resistance in the tank coil, loading due to power being coupled from the circuit and the impedance is not purely resistive. 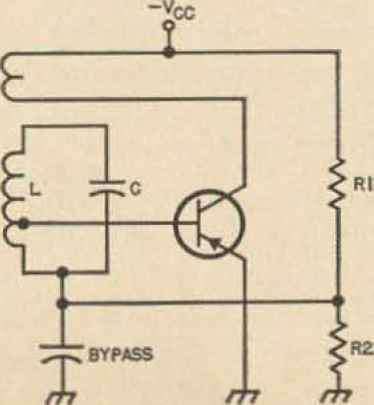 In a practical Colpitis oscillator for example, the feedback circuit would be represented as shown in Fig. 22B; Zl is the output impedance of the transistor, while Zi is the input impedance, In this circuit currents ii and i:? are not exactly the same magnitude or of opposite phase as in the ideal lossless circuit. The loading of the base circuit (Zi) causes the current i* to fog the collector iriving voltage across Zl by less than 90°; hence the base driving voltage lags the collector driving voltage by something less than 180°. On the other hand, in the Hartley circuit represented in Fig. 22C, the base loading causes the current is to lead the base driving current by less than 90and therefore the base driving voltage leads the collector voltage by less than 180°. Fig. 23, Connecting a zener diode across the tank circuit of a Clapp oscillator to obtain output stability. tiallv compensates for the effects of transit lime. For this reason the ('olpitts oscillator is somewhat superior lo the Hartley circuit at the high and very high frequencies. The requirements on any oscillator circuit are varied, bill in addition to frequency stability, there are several important characteristics which serve to specifv the performance of any particular circuit. Perhaps most important of these are amplitude stability, harmonic content, output power level, efficiency and noise output. 1. Limitation of the available dc voltage or current by the capability of the supply. 3* Nonlinearities in external loads. This is true because the external loads are often a function of voltage and current; above a certain amplitude their values change so that the condition for oscillation is no longer satisfied. In any case, the amplitude of oscillation will build up until it is liirtited by one of these three basic limiting mechanisms. When the oscillator is designed for high efficiency and (lie output voltage nearly equals the supply voltage, variations in the supply will cause fluctuations in output power. These fluctuations may be eliminated by stabilizing the supply voltage with a zener diode. Another technique wliich is slightly more sophisticated has been successfully applied to variable frequency oscillators (Fig, 23), Here the output is compared to a reference diode and the difference fed back to the transistor. Whenever the ac voltage across the capacitor in this Clapp oscillatoi exceeds a value determined by the variable resistor R3, the diode conducts a compensating base current and reduces the output amplitude. In many applications it is desirable to restrict the output power of the oscillator to one single frequency. In other cases harmonics are desirable for frequency multiplying. I here are always certain nun linearities in an oscillator circuit which give rise to signals as multiples of the fundamental. The harmonic content depends on many factors and is as difficult to control as is stability, but primarily it is dependent upon the non-linearities in the circuit and the filtering action of the tank capacitance, [f very low distortion is desired, push-pull operation in a two-transistor oscillator may be advised. On the other hand, nonlinearities may be deliberately used to produce frequency multiplication. rhis is done In incorporating another tank circuit into the oscillator which is tuned to the desired harmonic. monic content. The requirements for frequency stability and harmonic content are closely connected with the power, voltage and current-handling characteristics of the transistor used in the circuit. The conversion efficiency ol the transistor oscillator depends primarily on the class of operation and increases as you go from class A to B to C, However, the circuit must be initially biased somewhere in the active re gion to insure that the oscillator will be self-starting. With most transistors, efficiencies of about 50% in class A, 7H% in class B and 80-905S in class C may be expected. 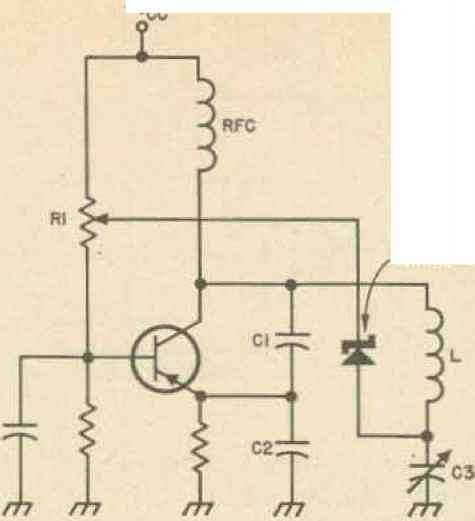 A bypassed emitter resistor permits class C operation in a maimer somewhat similar to the . id-leak method used with vacuum-tube oscillators. An average voltage builds up across the emitter RC combination that provides reverse bias for the emitter diode, With an initial operating point near cutoff, rising oscillations will first result in clipping at the low-current end of the load line, and eventually the buildup will be limited by the nonlinearities at the high current end; the operating point will eventually He in the cutoff region. The efficiency of an oscillator is reduced by the dc losses in the resistors of the bias circuit and is tied in very closely with the required operating point stability and ease in gelling I he oscillator started. AC losses in the resonant tank also reduce efficiency, and a high unloaded 0 in the tank circuit is desirable, o obtain high efficiency it is necessaiy in all classes of operation to utilize as much of I he available dc supply voltage as possible, with the peak ac collector voltage being equal to approximately 90% of the supply voltage. Unfortunately, the requirement for high efficiency will lead to low Q of the loaded tank circuit. This may cause poor frequency stability and a compromise must be found. In many applications it is very important to keep the noise power from the oscillator at a minimum. This is particularly true in VI i converters where a minimum of noise should be injected into the mixer.